Does the Flu Vaccine “Shed?” Clearing Up the Myths and Misunderstanding. Short answer, the injectable vaccine is not something that we can claim “sheds,” as in that an individual injected could then spread/shed the virus injected with the vaccine. But the nasal spray, because it is a live virus, can shed. Now for further clarification, I attempt to do my best in this video to discuss the details surrounding the research that shows those who receive an injectable flu vaccine “shed” more flu virus. 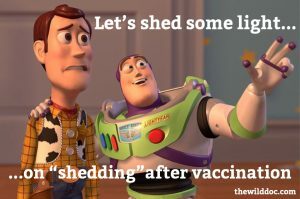 Just because we use the term “shed” does not automatically mean that the virus being spread/shed is coming from the vaccine. In fact, the research studies referenced in both a prior article CDC FUNDED STUDY SHOWS THE VACCINATED SHED 6.3 TIMES MORE FLU VIRUS, JUST BY BREATHING and prior videos which showed that those individuals who received the prior year or prior 2 years flu vaccine shed roughly 6.3 times more virus, but it was not stating that those people were shedding a vaccine virus. It simply meant that the person shed more influenza virus via breathing when they were infected with the flu. This, in essence, was indicating that people vaccinated spread/shed more virus as they breathe than when they were infected with a naturally circulating flu virus. Thus, this is not claiming that they were spreading/shedding a vaccine virus. Clarification and understanding on this subject is, in my opinion, crucial. I apologize for much of the confusion out there on social media and elsewhere. The reality is that the vaccine causes a weakened immune response which would then increase viral shedding by those infected with a virus that the vaccine is claimed to protect against and should cause alarm for all! That said, recipients of a live virus vaccine can shed the virus injected through that vaccine as a live virus will replicate, and the host/person would then be able to transmit/spread that virus to others. This research supports past research by showing that the flu vaccine does not protect against influenza because those who were vaccinated were infected by circulating flu strains, and it also causes an indirect detrimental effect on the immune function of the vaccinated individual increasing the viral shedding of an acquired influenza virus through means other than the vaccine. This then means that those vaccinated, as they catch the flu, can be the greatest threat to those the medical community use to argue for the use of the flu vaccine, such as cancer patients, the immunocompromised, the very ill, the very young, and the unborn are at the greatest risk in the presence of those vaccinated against the flu when they are infected with the flu.